[SOLVED] Logs directory not found. Can anyone help me with this, i keep going onto preferences and my logs directory but when i try to start a live report session it says it cannot read the directory. Re: Logs directory not found. Managed to fix that problem by typing "/combatlog" ingame rather than pressing "Start a live report session" on the client. But now i have a problem of not being able to find any of my logs to upload. You enable the combat log in-game using the /combatlog command (or a suitable add-on like LoggerHead). WoW writes the combat log to the World of Warcraft\Logs\WoWCombatLog.txt file. The client reads this file and analyzes/uploads its contents to the WoL website. Hence, you need to *both* enable the combat log in-game *as well as* start the live report session in the client. You raid with the combat log enabled and upload this log after the raid. 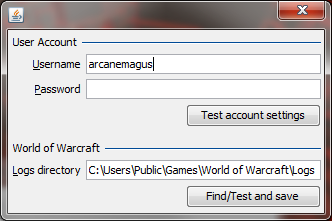 This is done using the "Open the WoW log" button, which simply opens WoWCombatLog.txt for parsing/uploading. You use the Start Live Report Session button. The client starts watching the WoWCombatLog.txt file for changes and uploads new chunks during your raid, updating the report in a "live" fashion. WoW only writes to one single combat log file, WoWCombatLog.txt. This means that consecutive raids will end up in the same file, causing the client to upload data from two or more raids for a single report if the log is not cleared inbetween. You should use the client's Tools --> Split & Archive function to work around this issue. When using this function, the client splits the combat log in chunks separated by at least 20 minutes of idle time. For each of these chunks a ZIP file is created with its start time and saved in the WoW\Logs\archive folder. If you would like to upload one of these chunks, extract the TXT file inside and upload that using the Open a File button in the client. The client will ask you whether you want to split&archive the log each time you use the "Open a File" or "Open the WoW log" functions, but not when using Live Report. For the Live Report function, the WoWCombatLog.txt file must exist when starting the report. If you've just deleted the file through Split & Archive or manually, you'll need to enable combat logging in-game to make WoW create the log file before starting the live session. You may have to cast a few spellsor hit a mob/target dummy a few times before WoW actually creates the file. Verify the location of your combat log file using the steps detailed in the first post of this topic. When you've found the combat log file path, it should be either C:\Program Files\World of Warcraft\Logs\WoWCombatLog.txt or C:\Users\Username\AppData\Local\VirtualStore\Program Files\World of Warcraft\Logs\WoWCombatLog.txt. Now make sure that the resulting path (i.e. the part before WoWCombatLog.txt) is set as the WoW logs dir in your Edit --> Preferences menu. Maihem, I do exactly as you say in the previous post, yet it says "Could not save setting: C:\Program Files (x86)\World of Warcraft\Logs\WoWCombatLog.txt is not a directory." I have typed /combatlog in game, and pressed the "Start Live Report Session" button, and it still says this is not a directory. Any tips? Yes, perform step 1: Verify the location of your combat log file using the steps detailed in the first post of this topic. Enter the path shown in the popup as the logs dir. If that doesn't work, post the path from Process Explorer's Find Handle popup here. I try putting that in the logs dir, and still says "is not a directory." Well that is rather fail on my behalf. It clearly says above the directory is the part before the .txt stuff. I apologize for my stupidity. thanks for the help! Glad we could help you solve the problem MaKing this as solved.